(Nanowerk News) Getting water across lipid membranes is not easy. In nature, molecules called aquaporins, discovered in the 1990s, move water from one side of a biological membrane to another, but the molecules are fragile and bulky. Now, researchers from the A*STAR Institute of Bioengineering and Nanotechnology have synthesized a much smaller molecule, which behaves like a ‘molecular drinking straw’ and which may have applications in water purification and elsewhere. The blue and orange molecules are identical, and stack on each other to form the helix. 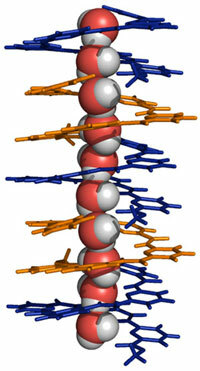 The central tube of the helix holds a one-dimensional string of water molecules. For some years, Huaqiang Zeng of the Institute of Bioengineering and Nanotechnology has led a team aiming to produce tubular molecules that could pipe water across membranes. In 2012, they created molecules that stacked into a helical tube; unfortunately, this tube was not particularly good at holding water in its central tunnel ("Chiral crystallization of aromatic helical foldamers via complementarities in shape and end functionalities"). Undeterred, Zeng’s team set out to modify that molecule. Substituting a carboxyphenyl group for a carboxybenzyl group was just what was needed — once again the molecules stacked into a helix, but this time it comfortably held a ‘string’ of water molecules ("Proton Gradient-Induced Water Transport Mediated by Water Wires Inside Narrow Aquapores of Aquafoldamer Molecules"). “The continuous one-dimensional ‘water chain’ trapped by the molecules is indispensable for mediating water transport across a lipid membrane,” says Zeng. But early experiments attempting to use osmotic pressure to drive water through the ‘straw’ into a membrane-bound compartment (vesicle) drew a blank. “We repeatedly failed to demonstrate the water-transporting ability of the molecule when using a sodium chloride concentration gradient,” he says. Zeng explains that the team’s ‘molecular straw’ beats the naturally occurring aquaporins in a number of ways. It is 40 times lighter, has a higher thermal stability, is expected to scale-up more easily for industrial applications and retains its functionality better when inserted into biomimetic membranes.